If you’re among the thousands struggling with the high cost of housing in Seattle, here’s a statistic that might make you wince. 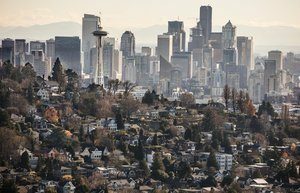 Census data show that in 2016, more than one in four Seattle homeowners owned their home outright, free from any mortgage debt. This lucky segment of Seattle households has grown at a remarkably fast pace. There were about 31,000 owner-occupied households with no mortgage in 2010. By 2016, the most recent data available, the number had jumped to almost 42,000 a 36% increase. That’s nearly seven times faster than the rate of growth for homeowners carrying a mortgage. The data show that Seattle has also outpaced most other big cities. Among the 50 most populous U.S. cities, we rank fifth for the increase in mortgage-free homeowners since 2010. One factor, certainly, is the massive baby boomer generation, now aging into retirement. This group makes up a big chunk of Seattle homeowners — more than 40% belong to this generation. Interestingly, there were around 2,400 Seattle homeowners under the age of 35 who owned their home outright in 2016. That number more than doubled from 2010, which makes millennials the fastest growing age group of mortgage-free homeowners. Maybe they’re successful young tech entrepreneurs — or perhaps they just come from wealth. The data, unfortunately, doesn’t reveal how they were able to pay for their home in full.